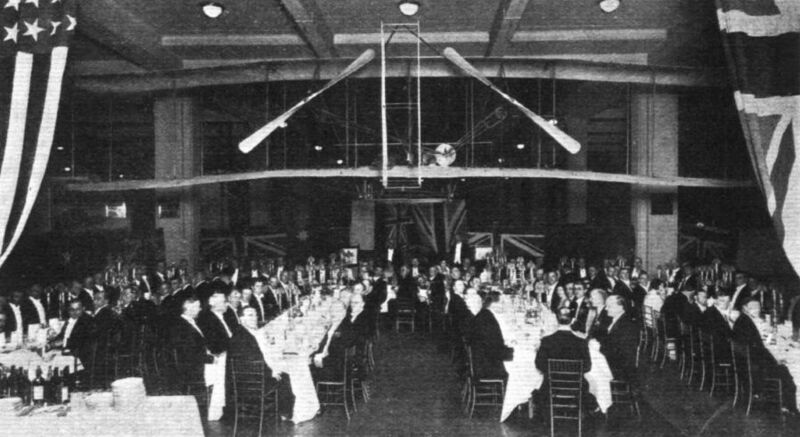 WILBUR WRIGHT ANNIVERSARY BANQUET: The guests at South Kensington Museum seated beneath the actual aeroplane in which Wilbur Wright made the first flight at Kitty Hawk on December 17, 1903. 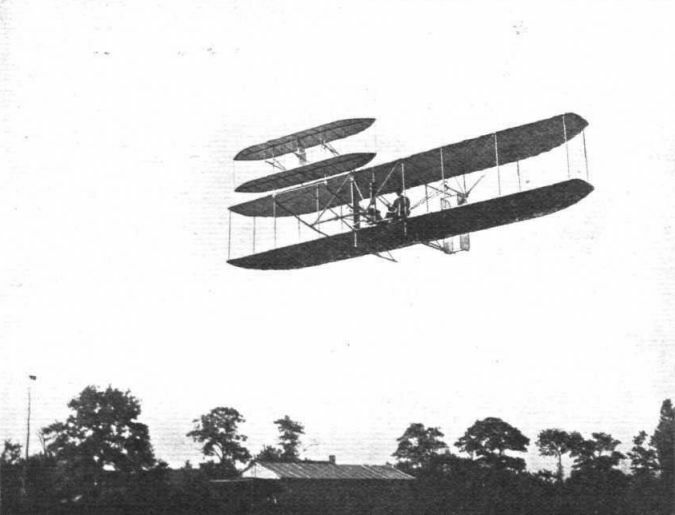 Mr. Wilbur Wright flying one of the early Wright biplanes - the first practical development of the 1903 Kitty Hawk experimental machine - at Le Mans, in August, 1908. 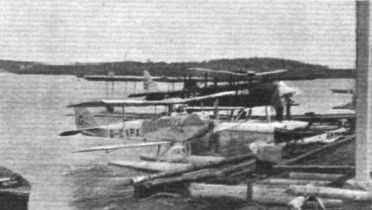 SEAPLANE FLYING IN CANADA: D.H. "Moth" seaplane, D.H.61 seaplane, and an old H.S.2Ls flying-boat at the Sioux look-out base of the Ontario Government Air Service. "MOTH" MOTOR MASCOTS: Our picture shows two realistic models of the D.H. "Moth" - a seaplane and a land plane - intended for use as motor mascots. They are made by the Birmingham Medal Co., the well known Medallists and Silversmiths of Birmingham. THE BOULTON AND PAUL "PARTRIDGE": These two views show the first machine. In the second, ailerons will be fitted to both planes. The engine is a Bristol "Jupiter" Series VII supercharged. 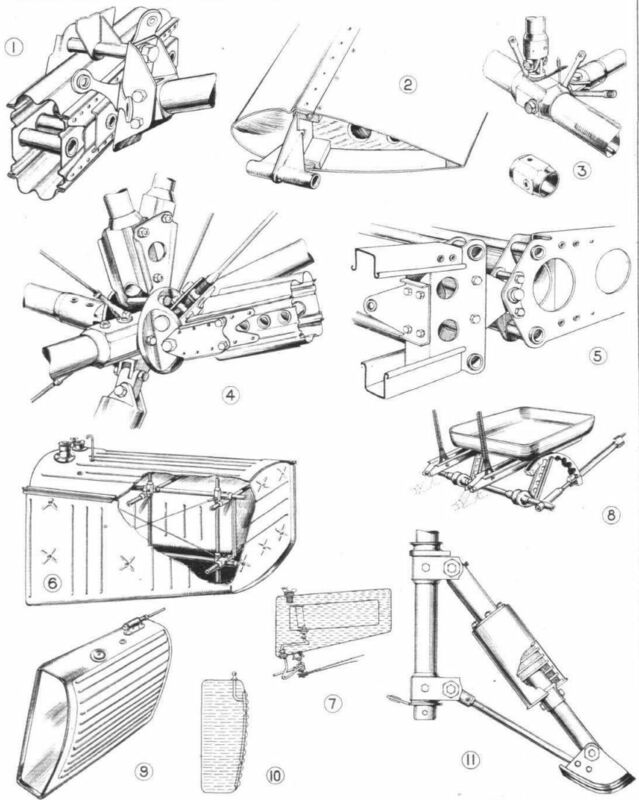 The Boulton and Paul "Partridge": Sectional view of oleo-pneumatic undercarriage leg. The Boulton and Paul "Partridge": Perspective diagrammatic view of the controls. Inset, the adjustable pedal. 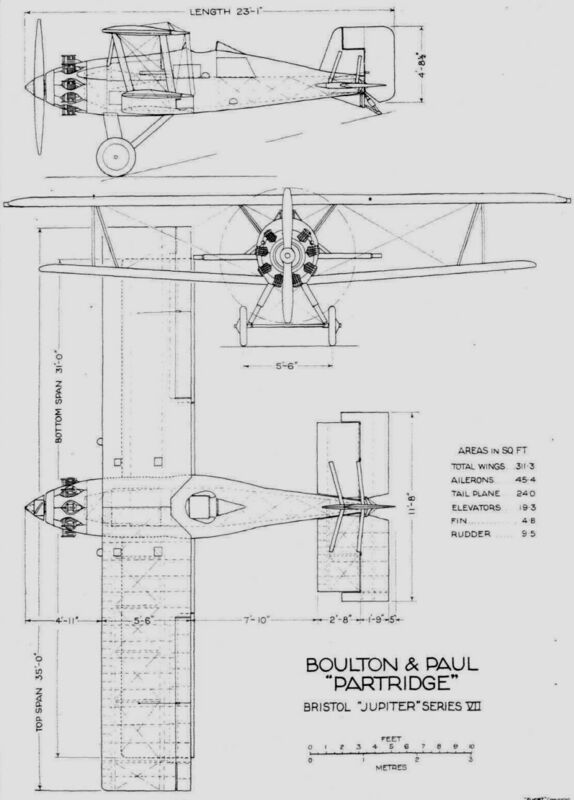 THE BOULTON AND PAUL "PARTRIDGE": Some constructional details. (1) Main wing spar joint. (2) Inter-plane strut with end attachment. 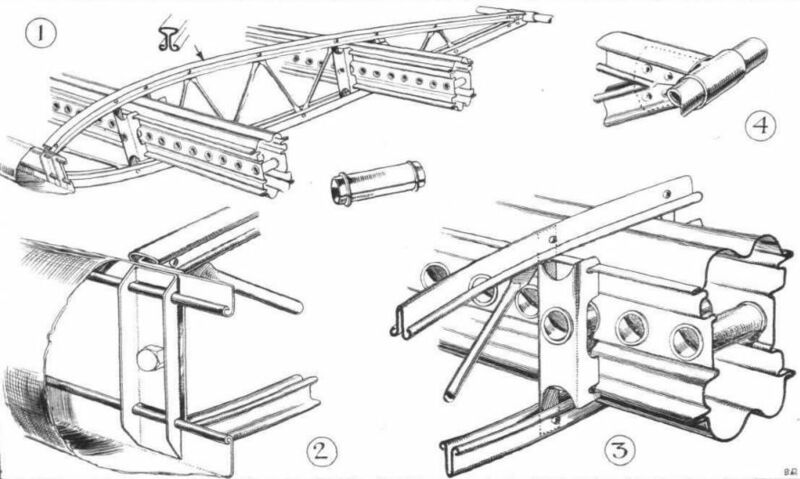 (3) A typical fuselage frame joint. (4) The wing spar attachment joint in front portion of fuselage frame. (4) Outer hinge of elevator. (6) and (7) Sectioned view and section of petrol tank. 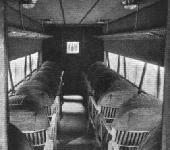 (8) The arrangement of pilot's adjustable seat. (9) The oil tank. (10) Vertical section of oil tank showing cooler. 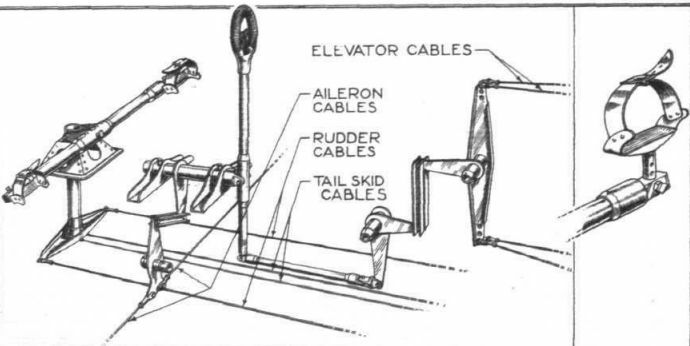 (11) The tail skid. 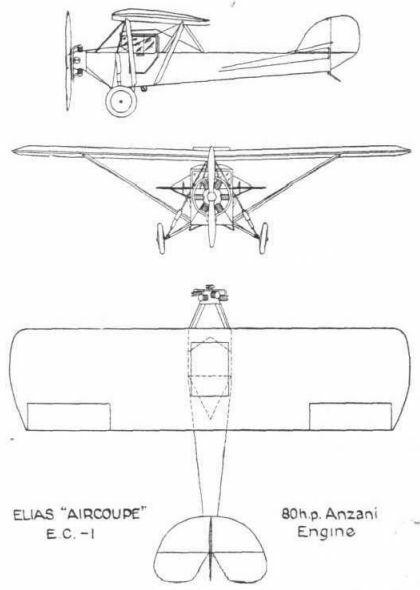 THE BOULTON AND PAUL "PARTRIDGE": Some constructional details of the wings. (1) General view showing main spars and a rib. (2) Attachment of metal leading edge to rib. (3) Attachment of rib to main spar. (4) Attachment of tubular trailing edge to rib. 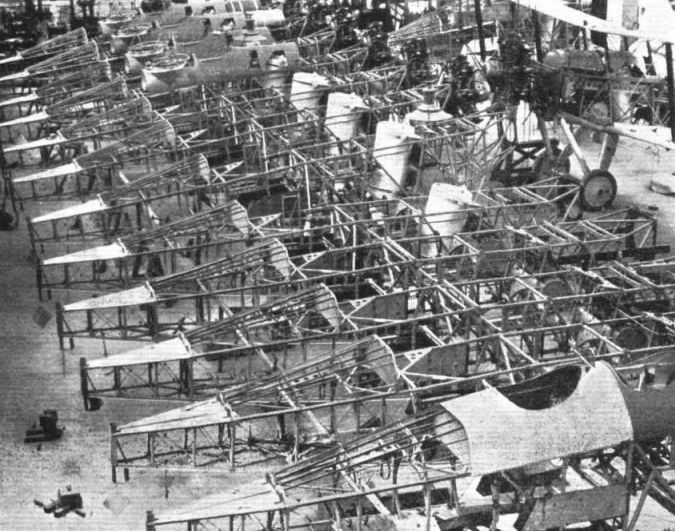 Mass Production at Yeovil: This photograph, taken in the Westland Aircraft Works, shows some of the "Wapitis," which are now being built for the Royal Air Force. 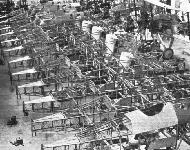 This machine incorporates several novel forms of all-metal construction. The engine fitted is the Bristol "Jupiter." THE BRISTOL "JUPITER" IN NEW GUINEA: Some views of the Junkers monoplane, fitted with a Bristol "Jupiter" engine which is used by the New Guinea Gold Co. We have previously referred to the activities of this company, which makes good use of the machine in spite of very unfavourable "aerodrome" conditions." SEAPLANE FLYING IN CANADA: Ontario Government's D.H.61 seaplane on Lakes Renir and Oba. SEAPLANING: Col. 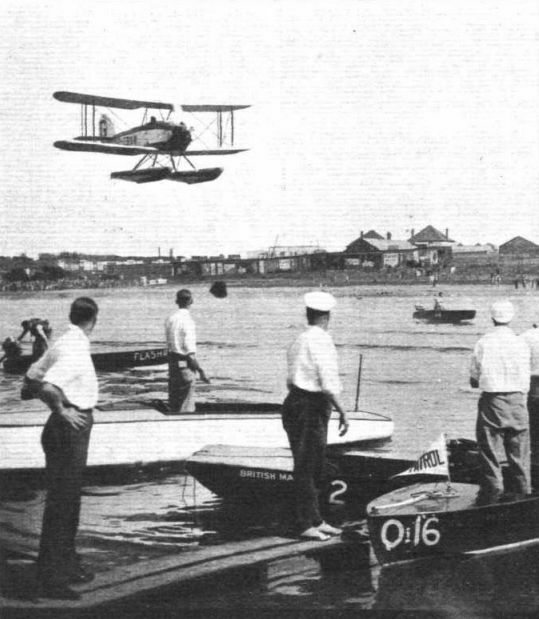 The Master of Sempill racing a Blackburn "Bluebird" light seaplane over the Welsh Harp, Hendon, in competition with an outboard motor-boat. 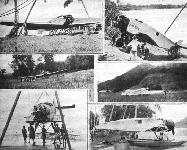 He has toured Great Britain and flown the North Sea in this seaplane. ADAPTABILITY! 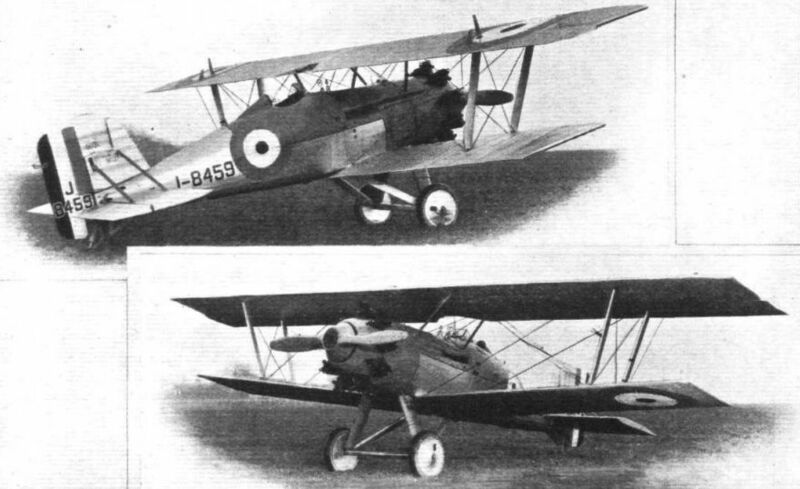 This picture of four Fairey III.F biplanes is an interesting "study in noses," and also illustrates the adaptability of this machine as regards power plant. Each machine is fitted with a different engine, viz. :- (From left to right) Lorraine Type Ed. 12; Bristol "Jupiter," Series VIII; Napier "Lion XIA"; and Rolls-Royce F.XI. 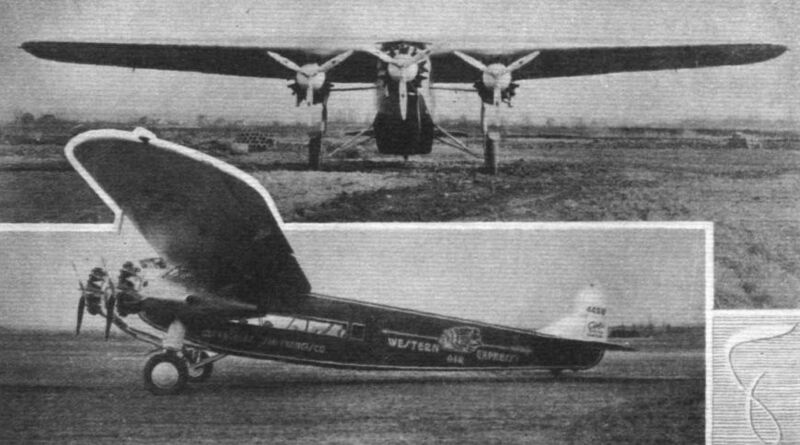 THE FOKKER F.10: Two views of the latest American-built three-engined Fokker commercial monoplane. The engines are 410 h.p. Pratt and Whitney "Wasps." 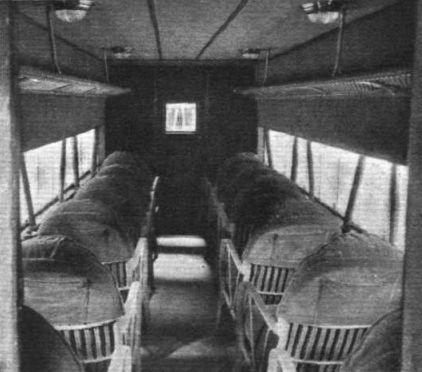 THE FOKKER F.10: View inside the passengers' cabin, which seats 12 passengers. 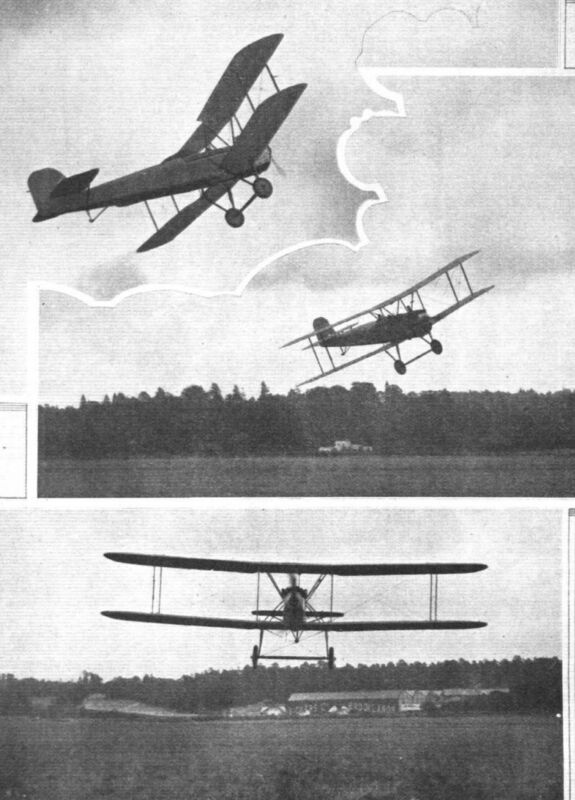 VICKERS MACHINES FOR SOUTH AMERICA: Three views of the "Vendace" advanced training machine, in flight. Fitted with a 330-h .p. Hispano 8F engine, this is the first machine of a batch which Vickers are supplying to a South American Government. 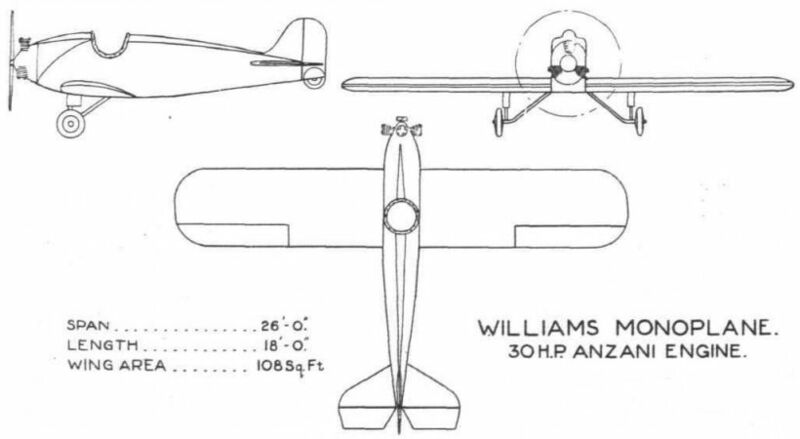 THE WILLIAMS MONOPLANE: An American single-seater, low-wing light 'plane, fitted with a 30-h.p. Anzani. 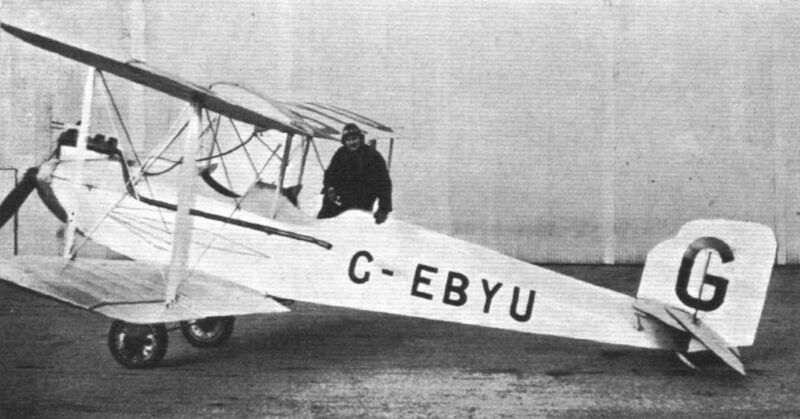 THE ELIAS EC-1 "AIRCOUPE": An American medium-size commercial monoplane, fitted with an 80-h.p. Anzani engine.